SAP Scripts is a SAP tool which is used to create formatted documents for external purposes and useful to print and transfer business documents. This Tutorial discusses about the basic concepts of SAP Scripts and usages in the various components interact. It also explains about how to create and maintain various layouts as well as execute print programs are included. SAP scripts tutorial has been prepared for the candidates who wish to learn the basics of SAP Scripts and their usage in work domain. This tutorial is useful to developers, consultants, and individuals responsible for maintaining and executing print programs. 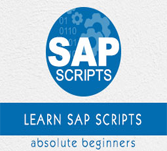 SAP scripts tutorial is designed for beginners with little or no experience in SAP Scripts. .